Fall is a busy time for most of us, busier still when peak pie season comes along and something called The Pie Academy is the center of your professional universe. Throw in a book tour and things start to get really interesting. Even I – already well-schooled in the art of overbooking myself – look at my late summer and fall schedule, a portion of which appears here, and wonder what on earth I was thinking earlier in the year when I said “sure” each time the phone rang. Apparently I have a serious case of what many my age – those old enough to know better – have: the age we are in our heads is roughly a half to a third of our actual years. In my head I’m still the 20-year old who threw a few things in a backpack, stuffed $200 in my wallet, and spent the next month traveling by train around Europe, sleeping in youth hostels and living happily on a few bucks a day. Other times I’m the guy in his late twenties and early thirties, with enough energy to chase four little ones around, cut his own firewood, and wake up at 4:00AM for several hours of uninterrupted writing. My younger alter ego may have had more gas in the tank, but it’s the actual me who is blessed with a deep supply of gratitude for where I find myself today. I love my work, my life, and I’m so very fortunate to have survived a serious heart attack a year ago this month. Physically, I’m in better shape than I’ve been in years. My attitude has been refurbished, too. I have you, my followers and fellow cooks, close family ties, and my loving wife Bev. I still dream, and if some of those dreams have been dulled ever-so-slightly by the blunt force of reality, my mind is sharp enough to chase down plenty of others. 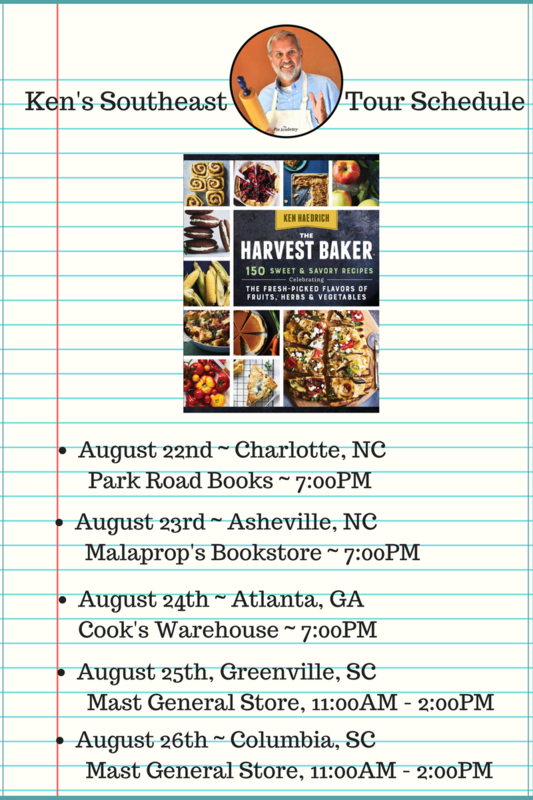 As for fall and that busy schedule of mine, the very fact that I am able to travel and have the good fortune to talk about my work and my life in the kitchen, meet with fans and readers, and teach skills that others find useful is a clear reminder of just how lucky I am. Thanks for taking a moment to stop and read this. I’ll keep you posted on my upcoming travels and hope that our paths cross along the way. P.S. – If you are the proud owner of a copy of The Harvest Baker, I hope you’ll consider posting a review on Amazon. Thanks for your consideration.